What are we listening to when we listen to music? That may seem tautological, but bear with me. 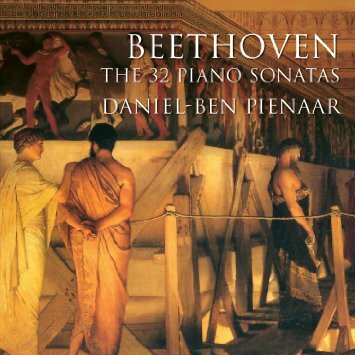 The question was prompted by listening (courtesy of Spotify) to a remarkable recording of the complete piano sonatas of Beethoven, performed by the South African-born, London-based pianist, Daniel-Ben Pienaar, hitherto unknown to me. Though I’d grown up with the named sonatas like the Moonlight, which my mother used to play, I only got to know all 32 Beethoven sonatas—the so called ‘New Testament’ of the piano—back in 1990, when our friend Gustav Fenyo performed complete cycles in a series of concerts in Glasgow and Edinburgh. Gustav has always seemed to me an under-appreciated musician, and his playing, especially of those sonatas I’d not previously encountered, was a revelation. Across those 32 incredible works he revealed an imagination and an energy at work that has few parallels in any art form in history. More recently I’ve been enjoying Paul Lewis’s complete recording, for its clarity, its sense of structure, and its intense musicality, but I only had to listen to one of Pienaar’s performances to know that this was music making in a different league. A great deal of ink has been spilt, in the world of classical music, on the subject of interpretation. There are those who favour the approach of, to take an extreme example, a Glenn Gould, who so impresses his own vision on a score that it effectively becomes ‘Gould’s Beethoven’, or Bach, or whoever. At the other extreme is a pianist like Alfred Brendel, famed for his fidelity to the score, and the modesty of his own personality, musically speaking that is. Daniel-Ben Pienaar fits neither of these stereotypes. There is nothing remotely objective about his playing, but nor is it wilfully idiosyncratic. For me, it’s like cleaning an Old Master—as if he’s stripped away layers of accretion to reveal what Beethoven originally intended. A dangerous claim, of course, and perhaps a foolish one. So I began to think about why his performances were affecting me so strongly. It was Goethe who apparently first called architecture ‘frozen music’, but, according to some sources online, the full quote should be ‘music is liquid architecture, and architecture is frozen music’. The first part of that statement is what I want to focus on. As we listen to music we experience it as flow, as duration in time. But, in something like a Beethoven sonata, we also—if we already know it—hold in our heads our awareness of its overall structure—its architecture—or else, we come to understand that structure retrospectively. The best performers, and, I would argue, the best listeners, need to hold this contradiction in balance, to understand and experience the music as simultaneously flow and architecture. This is what I think Pienaar does consummately. Listening to the variation movement at the end of Op 109, one of the ‘late’ sonatas, it seemed to me that Pienaar was unfolding the music as a fine jazz pianist develops an improvisation—like Keith Jarrett’s famous ‘Köln Concert’—and, like Jarrett, even as he gave the impression of spontaneously discovering the music’s direction, so he was all the time holding in his head that crucial sense of its destination. Beethoven, after all, was famed in his lifetime above all for his improvisations at the keyboard. Of course, this doesn’t just apply to Western classical music, it’s equally true of jazz like Keith Jarrett’s, or of non-western traditions like Indian ragas. And this is where, finally, we come to Erwin Schrödinger and his infamous thought experiment, involving putting a cat in jeopardy. Schrödinger was attempting to illustrate the paradox that an electron can be simultaneously thought of as both a wave and a particle, and so you can never be certain, at the same time, of both its location and its velocity. He envisaged putting a cat in a box with a radioactive sample, a Geiger counter and a bottle of poison. If the Geiger counter records an emitted particle, it smashes the bottle and the cat dies. As quantum theory claims that we only ‘collapse’ a particle into a specific state by observing it, we’re faced with the paradox that we only know if the cat is alive or dead by opening the box and that, until that point, it could be said to be both alive and dead. So, a truly gifted musician will resolve that paradox. He or she will be able to present the music—from a composer’s score, or as they improvise it–as both flow and architecture, or, to pursue the metaphor, as both wave and particle. When that resolution is achieved we, the listeners, may have an extraordinarily heightened experience; as when, even on a recording, the last movement of Op 109 can reduce me to tears. This is why, of course, it’s so important for those presenting new and/or unfamiliar music to tell audiences how long it’s going to last. How we respond to music we don’t know will be entirely different according to whether we expect it to last five or fifty minutes. Imagine being sat down to a Bruckner symphony without knowing what was coming. I think this also applies to other artforms. A couple of weeks ago I saw the latest double bill from the wonderful Scottish Dance Theatre. I was very glad indeed that the programme gave the durations for both works. The incidental gestures, interactions, and set pieces all fell beautifully into place as I anticipated them moving towards each work’s conclusion. Flow and architecture. This is perhaps the main reason why I find e-readers so unsatisfactory. There’s something very pleasurable about glancing at a book and seeing from the location of the bookmark how far you’ve gone, and how much pleasure—or effort—still awaits you. A digital notification that you’re on ‘page 92 of 483’ just doesn’t do it for me, not least because they’re not real pages! On the other hand, too great a familiarity with duration and structure can be a drawback. If the average TV cop drama is always an hour long (give or take adverts) then you always know when the villain is about to be unmasked. You may experience the pleasure of anticipation, but not the greater stimulus of complete surprise. So, to come back to where I started: what I think I’m listening to, when I listen to Pienaar’s Beethoven, is an extraordinarily sensitive response to that crucial need to hold flow and architecture in balance. Or, to use a quote attributed to another great German thinker, Gottfried Leibnitz: ‘Music is the pleasure the human mind experiences from counting without being aware that it is counting’.